Despite the documented advantages and widespread use of hydraulic seeding and planting technologies in controlling erosion and establishing vegetation, the understanding of hydraulically-applied materials and their cost-effective benefits remains a mystery to many. Much of this stems from a lack of direction and material categorization by the erosion control industry. Traditionally, green-colored slurries have been applied on areas such as steep slopes, commercial and residential properties, golf courses and athletic facilities. To an untrained eye, the materials exiting the hydraulic mulching equipment appear the same. However, contained within these slurries are a growing family of refined wood matrices, tackifiers, super-absorbents, flocculating agents, man-made fibers, plant biostimulants and other performance enhancing additives. Armed with little, comparable information, how do contractors and designers select a hydraulic technique or system that’s right for their project? This article offers a basic categorization of hydraulically applied materials based upon the attributes described above. It provides owners, agencies, designers and contractors a simplified process for product selection and helps ensure cost-effective applications while increasing awareness and utility for hydraulically applied erosion control techniques. It provides owners, agencies, designers and contractors a simplified process for product selection and helps ensure cost-effective applications while increasing awareness and utility for hydraulically applied erosion control techniques. The two primary goals when using hydraulically applied materials are erosion control and vegetative establishment. The hydraulically applied product provides immediate erosion protection while creating an environment that assists in accelerating vegetative establishment. Vegetation then provides the long term erosion protection while improving site aesthetics and acting as a filter to remove sediment and other undesirable storm water constituents from entering receiving water bodies. As the hydraulic erosion control industry has been slow to adopt its own testing protocols and procedures, several testing procedures have been adopted from the rolled erosion control product (RECP) industry. Many of the testing protocol and procedures have been developed by the Erosion Control Technology Council (ECTC), which may be accessed at www.ectc.org. These properties are described further below. Functional longevity is a measure of how long the hydraulically applied matrix can be expected to adequately protect the seed and soil from splash erosion caused by rainfall and the resulting sheet flow. It varies from region to region and depends on climatic conditions such as the intensity, duration and frequency of rainfall events, incoming solar radiation and temperature. Other parameters affecting functional longevity include slope aspect, slope inclination, slope length, soil type and vegetation characteristics. It can be correlated with percent effectiveness but the best method of determination is the use of field experience and judgment by a qualified professional. Functional longevity is an important consideration on challenging slopes and other sites with high erosion potential and the possibility of slow vegetation establishment. The C factor is commonly evaluated using ECTC Test Method #2, ASTM D6459 or from large scale testing using rainfall simulators at universities and test labs. Laboratories such as Utah State University’s Utah Water Research Laboratory, San Diego State’s Soil Erosion Research Laboratory and TRI Environmental, have the appropriate facilities to evaluate this property. This property can be highly variable and depends on rain event duration and intensity, soil type, slope inclination, slope length and hydraulic matrix application rate. Unless field conditions match those evaluated in the laboratory, the use of this property to quantify actual field performance can be difficult. However, this property does provide a means of comparative performance between different erosion control materials when tested under the identical conditions. Percent effectiveness is a key property in the development of a performance-based classification system. Vegetative establishment is a measure of ability of an erosion control material to encourage seed germination and plant growth and can be evaluated using ECTC Test Method #4. The larger the value for vegetative establishment, the faster the desired level of vegetation may be achieved. This property is highly dependent on the water holding capacity of the medium. Typically, the more moisture a medium can retain, the faster vegetation will be established. This property is also dependent on the flexibility of the vegetation establishment matrix. The more flexible the matrix, the better it conforms to the subgrade and the more uniform contact the matrix has with the seed and soil. Hydraulically applied materials are very flexible when compared to rolled erosion control materials that must have a smooth seedbed to maintain intimate soil contact. Hydraulically applied materials are typically used in areas that only receive rainfall impact and sheet flow (i.e. slopes). Unexpected rainfall events on unprotected slopes can cause rills and gullies to develop. For constructed slopes that are steeper than 2H:1V, it can be difficult – if not impossible – for heavy equipment to access these slopes to grade them smooth. Within the pre-existing rills and gullies are areas of potentially concentrated flow and therefore areas where shear stresses can develop. Under these conditions, shear stress of the hydraulic matrix is an important property and can be evaluated using ECTC Test Method #3. With a general understanding of the properties that determine hydraulically applied material effectiveness, contractors and designers can now better understand what type of matrix is right for them. Hydraulically applied materials are combinations of wood and wood cellulose fibers and water, with or without the addition of tackifiers, stabilizing emulsions, flocculating agents and man-made fibers. These ingredients are mixed in hydroseeding equipment and sprayed onto disturbed soil surfaces to protect from wind and water erosion. They can be applied without seed for temporary erosion control or with seed, fertilizers and soil amendments for permanent or temporary vegetative establishment. These categories of hydraulic mulches are arranged in order of increasing performance and presented in Figure 1. Further explanations of the mulches are described below. Hydraulic mulches (HMs) consist of shredded wood and/or paper fibers, water and/or a stabilizing emulsion. Stabilizing emulsions typically consist of an organic tackifier or an inorganic polymer. Common stabilizing emulsions include guar gum, psyllium (plantago), and/or polyacrylamide. Application rates vary from 1,500 to 2,500 lb/ac based on fiber type, slope gradient and slope length. HMs are commonly used to aid in the establishment of vegetation and the temporary stabilization of flat surfaces and moderate slopes (< 4H:1V). HMs typically have a functional longevity of less than three months. Stabilized Fiber Matrices (SM) consist of wood or paper fibers, stabilizing emulsions and water. If paper fiber is used, it should be blended with wood fiber. Common stabilizing emulsions include cross-linked hydro-colloidal tackifiers and polyacrylamide flocculants. These are typically added at a rate of 3-5% by weight. Cross-linking is an important step in increasing the bond strength and longevity of the hydro-colloidal tackifier. Cross-linking is a chemical process that reduces the water solubility of the tackifier and, therefore, increases the longevity. Cross-linking also keeps the tackifier from rewetting and potentially leaching after the matrix has cured. Polyacrylamide flocculants function differently than cross-linked, hydro-colloidal tackifiers. The tackifiers form a chemical bond that holds the fiber matrix together, thereby protecting the soil from rainfall impact and splash erosion. Polyacrylamide holds soils in place by ionically bonding them together to increase the particle size. This results in greater infiltration through the soil pores and increased resistance to erosive forces. Regardless of the type of stabilizing emulsion used, the matrix must dry thoroughly after application, which typically takes 12 to 36 hours depending upon weather and antecedent soil moisture conditions. 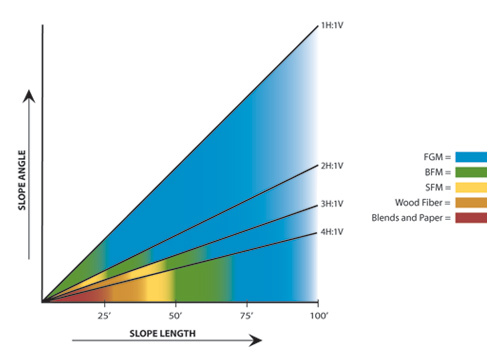 Application rates vary from 2,000-3,000 lb/ac based on slope inclination. SMs are commonly used to stabilize flat pads and moderate slopes (<3H:1V) for a period of three to six months. Regardless of the type of stabilizing emulsion used, the matrix must dry thoroughly after application, which typically takes 12 to 36 hours depending upon weather and antecedent soil moisture conditions. Bonded Fiber Matrices (BFMs) have been in use for over 15 years and have received acceptance by many state departments of transportation, public agencies and private specifiers. BFMs are composed of thermally refined wood fibers, cross-linked hydro-colloidal tackifiers (10% by weight) and are 100% biodegradable. 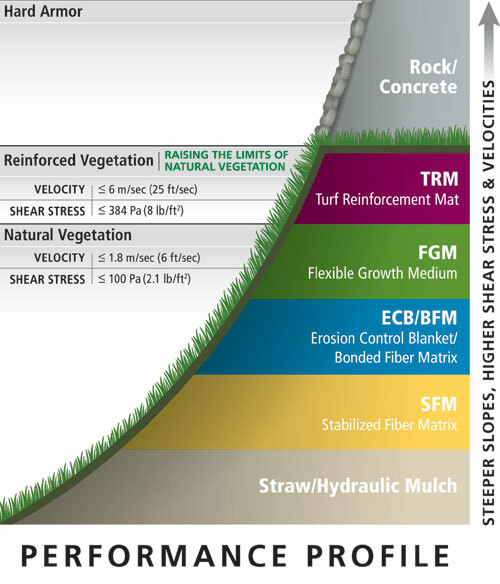 BFMs are designed to provide erosion protection for six to 12 months and are commonly used for erosion control and vegetative establishment on steep slopes (<2H:1V), long slopes and highly erosive soils. Curing takes approximately 24 to 48 hours and application rates vary from 3,000-4,000 lb/ac based on slope length and inclination. Flexible Growth Mediums (FGMs) are composed of thermally refined wood fibers, cross-linked hydro-colloidal tackifiers (10% by weight), and crimped man-made fibers (5% by weight). The man-made fibers are crimped to interlock and provide mechanical reinforcement of the matrix. FGMs are the highest-performing hydraulically applied technology and provide greater than 99% erosion control effectiveness. They also require no curing period. The use of man-made fibers increases the loft of the matrix and thereby increases the porosity and water holding capacity. 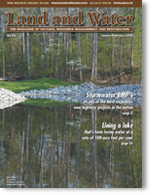 The increased water holding capacity has resulted in greater vegetative establishment than any other reported erosion control material evaluated using ECTC Test Method #4. FGMs have functional longevities of greater than 12 months. FGMs are commonly used to stabilize steep slopes (<1H:1V), long slopes, rough slopes, highly erosive soils and when rainfall is expected within 48 hours. As the slope length and gradient increase, the water travels at a faster velocity, exerting larger erosive forces on the soil. Therefore, for steeper and longer slopes, a higher performing product is warranted to adequately stabilize the soil and increase factors of safety. Figure 2 presents a simplified design chart that recommends a product category based on slope inclination and length. Today’s technologically advanced erosion control products offer specifiers and users exceptional advancements to help keep soil and vegetation in place. With this general understanding of available hydraulically applied technologies and the attributes appropriate for specific projects, users can be assured of selecting the technology that’s best for them. For more information contact Frank Lauro, P.E. Market Development Manager, Profile Products, LLC, Bakersfield, CA at: flauro@profileproducts.com or Marc S. Theisen, M.S., CPESC, Director of Business Development, Profile Products, LLC, Signal Mountain, TN at: mtheisen@profileproducts.com. ©2007 - 1998 Land and Water, Inc.